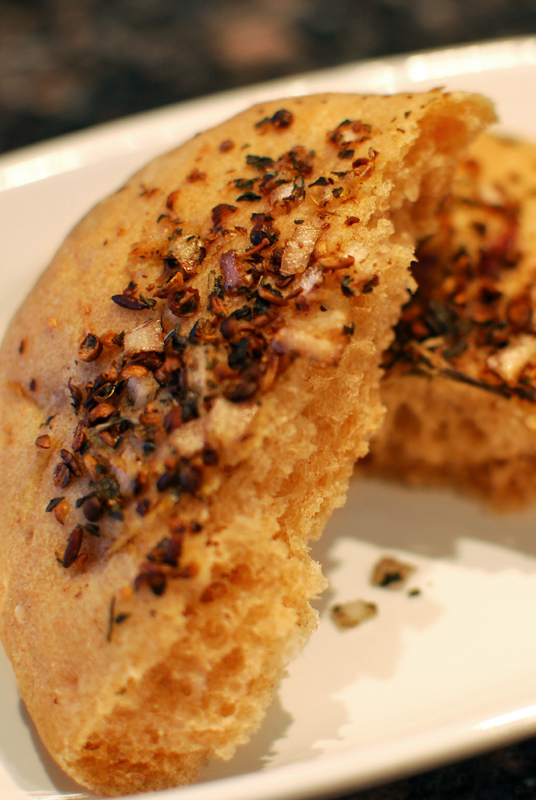 Today’s bread is a thick type of the flatbreads so omnipresent in the Middle East. 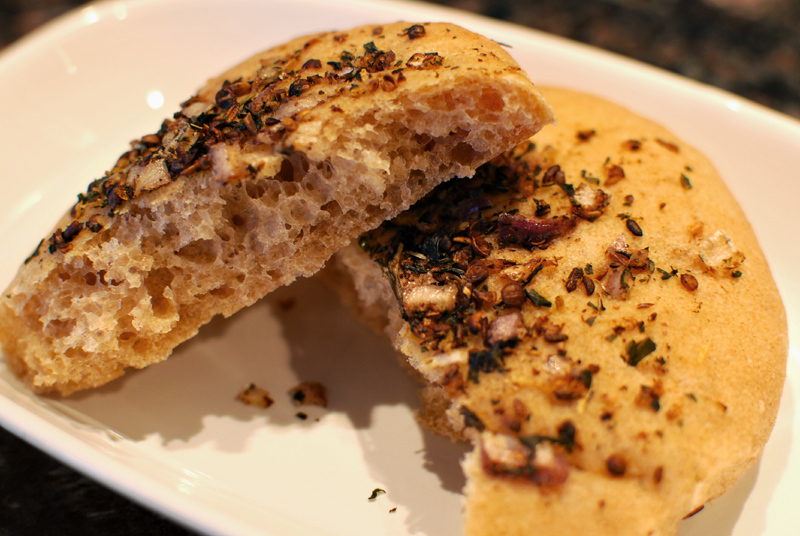 More substantial than a pita, these breads are topped with a mixture of lemony coriander seed, smoky cumin seed, and sweet-tart red onion. A small handful of mint rounds out the fragrant topping, and brings a needed brightness. Though these are too thick to wrap around and cradle food, as you might use a thinner flatbread, they would be perfect to slice open horizontally, like a sandwich roll, and fill with kibbeh, hummus, lamb patties, falafel, or whatever specialty you like. The flavors of coriander, cumin, onion, and mint are so common in the food of this region of the world, and match a wide variety of foods so well, that disharmony of tastes would be unlikely. The flavor of the bread itself is very mild, tending towards boring even; but that lets the aromatic topping take center stage instead. A fair amount of whole wheat flour is added for a more rustic bread, and to deepen the flavor as well. Overall, it’s a respectable little recipe that can be easily adapted to any personal preference you might have, either in topping or filling. 1. In the bowl of a stand mixer, whisk together the flours, yeast, and salt. Add the water and olive oil, and mix with the dough hook at low speed until all the flour is moistened, 1 to 2 minutes. Turn the mixer off, and without removing the bowl or the hook, cover loosely with plastic wrap. Let sit for about 20 minutes. 2. Remove the plastic wrap. Turn the mixer to medium-low speed, and knead until the dough is smooth and supple, 5 to 7 minutes. The dough should clear the sides of the bowl, but not be stiff. Add additional flour or water as needed to correct the consistency. 3. Turn the dough out onto a lightly floured work surface. Pull the outer edges of the dough into the middle, shaping the dough into a round ball. Transfer the dough to a large, lightly oiled bowl, turning to coat the dough with oil. Position the smooth side of the dough on top, and cover tightly with plastic wrap. Let stand at room temperature until doubled in size, about 1 hour. 4. While the dough rises, prepare the topping. In a skillet over medium heat, toast the coriander and cumin seeds until fragrant, 3 to 4 minutes. Crush coarsely in a mortar and pestle. Combine with the chopped onion and mint, and set aside. 5. Using a nonstick spatula, fold the dough over itself in thirds, as you would fold a letter, deflating the dough. Cover and let rest 5 to 10 minutes. 6. Turn the dough out onto a lightly floured surface. Divide the dough into 12 even pieces, and shape each into a round ball by rolling underneath your palm on the counter. Flatten the balls slightly. Cover and let rest 10 minutes. Line a large baking sheet with parchment paper, or sprinkle with flour or cornmeal. 7. Using hands or a rolling pin, flatten the dough into discs about 1/2 inch thick, making them slightly concave in the middle. Transfer to the prepared baking sheet. Dock the discs all over with a fork. 8. Brush the dough lightly with the olive oil, and sprinkle liberally with the topping mixture. Press the topping gently into the dough to help it adhere. Cover loosely with plastic wrap, and let rise at room temperature for 45 minutes, or until nearly doubled in size. Preheat the oven to 400º F.
9. Bake the breads at 400º F for 15 to 20 minutes, or until lightly browned and cooked through. Transfer to a wire rack to cool thoroughly.